Freddie Krueger from A Nightmare on Elm Street was created from the mind of Wes Craven, the same man that brought horror fans the “Scream” series of movies. I would venture to say its no way he could have known that when he sat down to create the character that later would be embodied by the extremely talented actor Robert Englund he would be creating an iconic horror figure that would stand the test of time as not only one of horror fan’s favorite villains but one of the greatest to ever to grace the big screen. 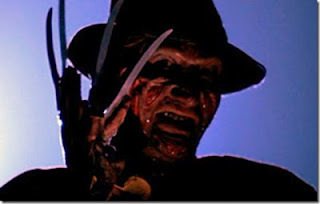 In retrospect, do you remember how Freddie Krueger came to be the mythic figure we came to know and love? If not, here’s the tale of his genesis. The story goes that some years before where the beginning of the movie picks up he was killed in a fire and a number of the town’s people were said to be responsible for his death. But think about this for a moment. How would “A Nightmare on Elm Street” have turned out if there weren’t a Freddie Krueger or some other central mythic nightmarish-figure to haunt the characters in their dreams? The importance of having this type of antagonist for this type of movie could not be overstated. He had to be someone who not only was extremely dangerous and who could elicit fear at his very appearance but would also be motivated by one of the strongest human desires, the desire for revenge. Wes Craven understood the need for his antagonist having each of these attributes if his vision for the movie was to be. Freddie Krueger wasn’t just someone the characters in “A Nightmare on Elm Street” dreamed about or coincidentally saw in their dreams; nor was he just the subject of their dreams. He was a lot more than that. To each of them, he was a nightmare, a nightmare unto himself. From which there was no waking up, from which there was no escape. When you and I lie down at night on the other hand, and occasionally experience a nightmare despite its effect upon us at that moment there is something deeply engrained in our psyches that provides solace, allowing us to know that if and when we awake, everything will be okay, it’ll be as it was. Our pulse rate may be elevated and our heart still may be racing, but that level of comfort will yet be there in the end. The characters in the movie unfortunately weren’t afforded that luxury. Wes Craven did something with his antagonist’s that made him, not only more frightful but also dangerous. What he did was blur the lines between the dream world and reality. This was evident when Freddie would follow the kids from their dreams into the real world. If you can remember the female character that while dreaming wrestles with Freddie and when she awakes she’s holding his dirty hat? That was when we as the audience really came to see what these characters were up against. We knew there was no getting away from this guy. Did Wes Craven envision the character as “death”, or possibly the grim reaper? Only one can surmise. If he did or didn’t, only he can answer that, but I don’t think it would be a stretch to compare Freddie Krueger to “death” or better yet the “angel of death”. However, unlike the angel of death who comes for a person’s soul, Freddie only wanted blood. If all it would have taken were a pot of coffee in order to stave off sleep, and therefore that nightmarish blood lustful villain, like the female character tried, then it would have been as simple as drinking some coffee. But it wasn’t that simple was it? At some point she would have to sleep, she knew there was no getting around that fact. She knew despite whatever the amount of coffee she consumed, eventually the coffee and the effects of its caffeine would give way to what her body would crave more so at that moment, and that being sleep. “A Nightmare on Elm Street” was what I would call an instant classic the day it was released. The premise was good and very much original, but the catalyst behind the story, what drove it, what absolutely allowed that premise to work can be summed up in just two words, Robert Englund. Cast anyone else in the role and the story we all loved and remember seeing back in the 80’s would have taken on a whole different dynamic, it would have also left us with a completely different impression. You only have to look to the most recent remake of the movie, where the iconic actor was noticeably absent from the lead role to appreciate just how much Robert Englund brought to the role of Freddie Krueger which with out question helped to make “A Nightmare on Elm Street” what we remembered it to be, a truly good horror movie.